Today me and Nicole went strawberry picking in Hobart Indiana, by the Dunes. When we got there, we had to drive all the way back to the furthest field, because that was the only one they allow people to pick in. The field was huge and sections of it were very muddy. It was so muddy, we had to take our shoes off and just go in barefoot! The mud was swampy, but cool and squishy on a hot day. 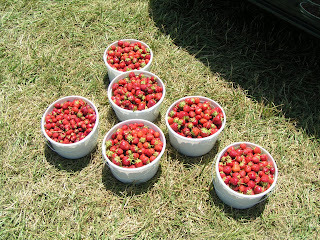 We got 6 buckets of strawberries, each bucket was about 5 lbs.